At the age of 14, Amin performed to one of the greatest Iranian conductors and composers, Majid Entezami who was very impressed by Amin's abilities at playing the violin and encouraged him to choose music as his career and introduced him to one of the best violin teachers in Tehran). Amin was soon joined Isfahan Music High School, Isfahan Symphony Orchestras conducted by Majid Entezami himself, Isfahan National Orchestra, Pegah Symphony Orchestra, Payvar ensemble, Isfahan Music School's Symphony orchestra and in many string quartets, quintets with fellow musicians. In 2009, Amin moved to the UK in order to continue his studies and to improve his skills as a violinist, conductor and a composer. He first moved to Manchester and within weeks, he was invited to play in charity orchestras such as Beethoven Symphony Orchestra, Hale Light Orchestra and Sale Chamber Orchestra where he met one of the Britain's finest musicians, Richard Howarth who was very impressed by Amin's musical abilities and violin techniques and they started working together ever since. Shortly after, Amin was awarded a place at the Leeds College of Music where he had such influential performances such as his performances at the BBC venue with LCM symphony orchestra and LCM sinfonietta. He also took up conducting and started having regular lessons under John Anderson. 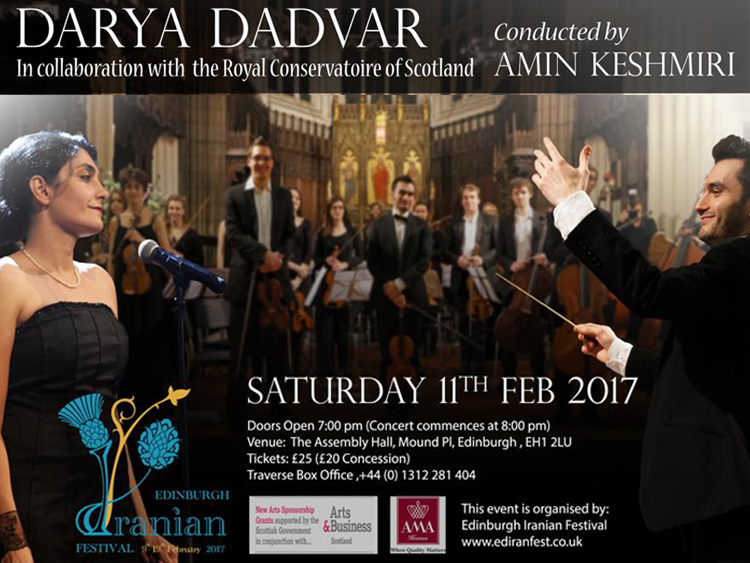 In autumn of 2011, Amin won the "The Royal Conservatoire of Scotland Trust" award and moved to Glasgow, Scotland to continue his studies as a conductor and a violinist at the Royal Conservatoire of Scotland (formerly known as the Royal Scottish Academy of Music and Drama). Since then, he has worked with Dr. Mieko Kanno (head of strings) Roland Roberts, Dr. Alastair Mitchell, Greg Lawson and Gina McCormack. 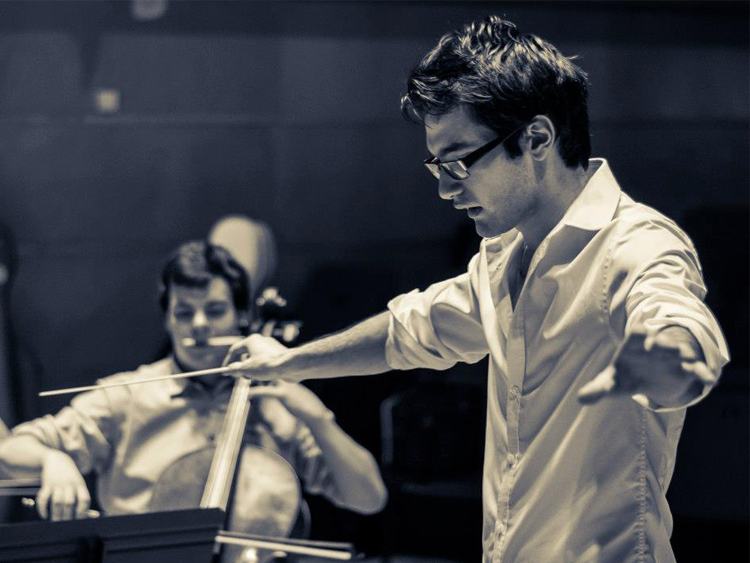 Apart from being fully involved with orchestras and string quartets as a violinist, Amin has been conducting orchestras at the RCS as well and has been involved in master-classes and mentoring sessions with great conductors such as Christian Kluxen (Assistant conductor of Royal Scottish National Orchestra), Garry Walker, David Danzmyr and Jean Claude Picard. He soon founded and established his own orchestra, ASO "Arezoo (Wish and Ambition) Symphony Orchestra" to introduce and promote Persian Classical music. He also is one of the founders of the "Keshmiri Ensemble". In 2013, Amin was the guest conductor and guest soloist of the Sale Chamber Orchestra for their yearly concert for the UNICEF for the 4th time. A few months later, he was awarded the "Royal Conservatoire of Scotland Trust" for the second time. He also played side by side with the Royal Scottish National Orchestra in the same year. As a composer, Amin has been writing a large portion of orchestral music including his first Symphony and a “Persian” piano concerto. He has also been composing music for films such as “The Scribbler” which won the best “drama” award at the Royal Television Society. He has also been nominated for the BAFTA 2015 for best music for motion picture. He has co-led the Royal National Scottish Orchestra and the BBC Scottish Symphony Orchestra. He is currently a PhD candicate at the Royal Conservatoire of Scotland, Vice President of the Students' Union, assistant conductor of the Kelvin Ensemble and a member of both academic board and board of govornors at RCS.